Net Profits: The author feels that despite Nike's 'Joga Bonito' ('playing beautiful') ads, beauty took a back seat to big bucks a long time ago for Brazilian soccer. 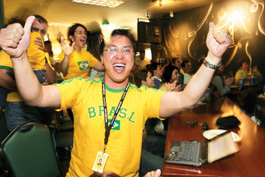 Clearly, Tony Luu, who caught the Brazil-Croatia game at La Senzala in Sunnyvale, does not agree. FOR THE most part, I've grown to hate the Brazilian national team, but I wasn't always this way. There was indeed a time when I was gullible, full of hope and didn't question whether the world was more complicated than people were letting on. So it's only natural that during a spell in my youth, I idolized the larger than life Brasileiros. My earliest memory of watching the World Cup was Argentina '78, and to this day I remember the sensory delights that came with gaining access to a love so deep even Barry White would've been proud. The Brazilians were certainly part of what made it beautiful, with goal scorers like Dirceu and the irresistibly named Roberto Dinamite. In the 1982 World Cup in Spain, Brazil thrilled everyone with their play, and I can recall with clarity rushing home from a high school graduation party to catch the tape-delayed Brazil-Scotland match. With pillars like Socrates, Falcao, Junior, Eder, Serginho and Zico, Brazil was the perfect ballet of futebol genius—except that being the most thrilling, creative and astoundingly brilliant team doesn't always get you to the top. The Dutch team of 1974 and the Brazilians of 1982 would likely agree on that point for not having accomplished the ultimate goal. You'd be hard pressed to find two teams that have burned themselves into the collective memories of soccer fans by the manner in which they delighted and then flamed out. And this is where my doubting began. After that 1982 World Cup, Brazil effectively sold their soul to become less the purveyors of poetic soccer in exchange for a more modern defensively oriented game where results mattered more than style. Is it wrong to hold an expectation dictating that playing beautifully is more important than winning? Yeah, maybe it is, but then again most countries don't bleat endlessly about how artful and naturally gifted their football can be quite like the Brazilians. I suppose I just get tired of this Nike-copyrighted myth of Joga Bonito™, as the Brazilians really aren't interested in playing beautifully as much as they're interested in winning, and it's been far too long for them to keep going on about it. Perhaps it's harsh to judge them in this way because, well, everyone wants to win, but with the combination of historical myth building and marketing collaborators with deep pockets (Nike Inc. anyone?) everyone wants to make a buck, too. It all becomes overbearingly hyped and tiresome to this futebol fan. That commercial interests have adversely affected the spirit of the game is not new, but Nike has taken things to new levels and was purported to have insisted that Ronaldo play the 1998 World Cup final in France—even though seriously ill on the day—as he was the superstar in Nike's global soccer aspirations. Brazil lost that day 3-0 to a better French side, but at least Ronaldo ran around the field, post-seizure, in his multicolored Nike boots. Four years earlier Brazil won the World Cup in USA '94 with perhaps the least exciting team in Brazil's history, and thankfully Joga Bonito™ was not yet in Nike's advertising vocabulary as it would have been one helluva tough sale. Nike chairman Phil Knight was reported in the The New York Times months later as stating that when Brazil played the United States at Stanford Stadium on July 4, "I rooted for Brazil because it was a Nike team. America was Adidas." Given that Mr. Knight made these comments months after the fact, he must have forgotten that viciously deliberate elbow that Brazilian left-back Leonardo delivered to American Tab Ramos, fracturing his skull. You won't see footage of that episode in Nike's Joga Bonito™ campaign, but maybe Phil wasn't there like I was when it happened. In fact, Brazil weren't even yet wearing Nike in WC '94 but Phil Knight already had his sights set and viewed the Brazilians and Nike as two ruthless peas in a pod of image and marketing shine. And still, it seems, multitudes of soccer fans and Los Gatos residents like to praise the perceived virtues of the recognizable Brazilians in their verdeamarelha above everyone else. Do you remember Rivaldo crumpled in a heap after a ball hit him in the lower leg and holding his face, of all places, during the last World Cup in 2002? I do, because it got a Turkish player sent off with a red card as Brazil was lucky to beat an exciting Turkish team. Rivaldo later admitted to his thespian aspirations and was fined about $10,000 by FIFA—after Brazil won the title, of course. Now I fully acknowledge the dominance and supremacy of the Brazilians, but marketing them as the sole proponents of "beautiful" football fails to acknowledge the reality that they are out there to win and will do whatever it takes to gain that result. Beauty has long become secondary in Brazilian futebol, and the truth is that the level of expectation placed on them at every World Cup is beyond anybody's ability to fully satisfy. Brazil have long established that they are, simply, the best there is, but let's get one thing straight: not everyone wants to see them win as much as they, in fact, do. I'd venture to guess that many Brazilians and football fans worldwide still wish the beauty outweighed the desire to win at all costs because I'll be the first to admit that there is always something beautiful lurking in Brazilian futebol and you don't have to look far to see the likes of Ronaldinho and Kaká waiting to take the lead role. Take a look at Spain and Argentina, though, if you want to see the game played beautifully this time around and I'll take my lumps for not being down with the verdeamarelha. Arturo Villaseñor is a librarian and a fair defensive midfielder with periodic aspirations to venture up-field. He lives in San Jose.